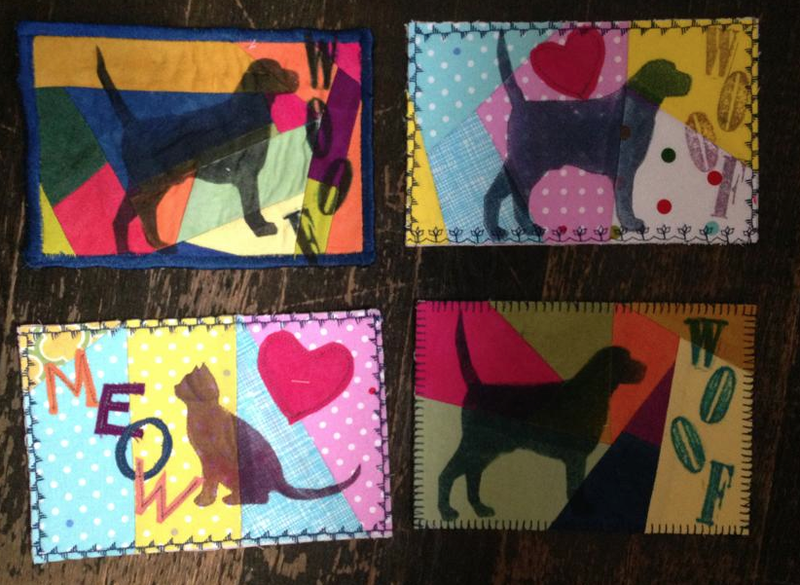 15 minutes play...BumbleBeans Inc.: Pet Postcard Challenge! 15 Minute style! Pet Postcard Challenge! 15 Minute style! A NEW 15 Minutes of Play CHALLENGE! How about a little Morsel of SOMETHING FUN? Have you heard about the Post Card Project? Last year at Houston, I stopped by the Pet Postcard booth and bought a few of their super cute postcards so funds would go to the below program... I made a few today using MADE FABRIC, and thought, now wouldn't that be fun if we all made one? or two, or three? 4 X6" pretty fun and easy! I BET YOU CAN'T MAKE JUST ONE! make one or two, post here, or email me the image to post it... then you will be responsible for sending them in. click link below. and how you can make and send in your own card! HOUSTON—August 7, 2013—During last year’s inaugural Festival Pet Postcard Project, attendees at International Quilt Festival/Houston purchased nearly 1,000 donated fabric postcards— sent in from all over the world—to help make a more than $20,000 donation to the Houston-based Friends For Life. This year, organizers hope to increase both the number of cards received and the amount raised for the no-kill animal shelter at the upcoming edition (October 31-November 3, with Preview Night on October 30). 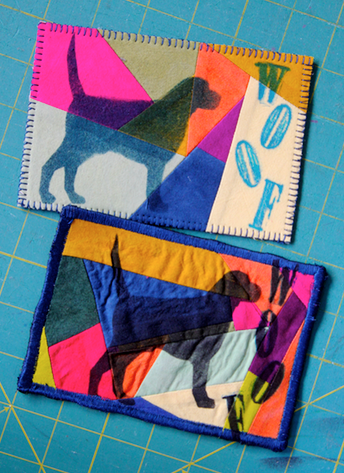 In addition, a special exhibit of quilts with canine and feline subjects, “It’s Raining Cats and Dogs,” will be on display. “We were very pleased with last year’s effort. Many of our attendees are pet owners themselves, so the cause was dear to them,” says Festival Founder and Director Emeritus Karey Bresenhan. 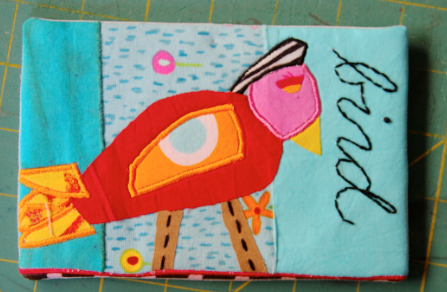 “Quilters are a generous group by nature, but now that we know how passionate quilters are about saving animals' lives, I am hoping we can double this amount this year and aspire to raise a whopping $40,000!" adds Pokey Bolton, Chief Creative Officer for Festival producer Quilts, Inc., who spearheaded the project. Funds will benefit the shelter’s “Thinking Outside the Shelter” program, which provides resources like food, supplies, and counseling for those in need, enabling them to keep their animals in the home and out of the shelter system altogether. This year’s donation will also benefit Friends For Life’s newly launched public/private partnership providing targeted areas of low-income neighborhoods with free spay/neuter and wellness services. “They gave their time, resources and talents to a shelter that many had never even visited. But their kindness, love of animals and generosity carried the day! Visit ow.ly/nIkpq for complete information about the Project and how you can make and send in your own card! Media inquiries: Contact Bob Ruggiero, Director of Publications and Public Information for Quilts, Inc. at pubs@quilts.com or 713-781-6864, ext. 116. I sew wanted to do this last year but life had something else in mind...things aren't looking up for this year either...I see the deadline to be received is Oct.22.....with luck and a miracle...I might get one done! I like this idea-it may just get my mojo flowing again!